There's too many cafe racers in the world of motorcycling right now. See Bike Exif's delectable collection, or browse any of your favourite custom motorcycle websites and they are, as Bert likes to say, "Chana." Anything and everything is being turned into a cafe racer by some very skillful people in the world. To recover from this overload, we decided to go for a ride. 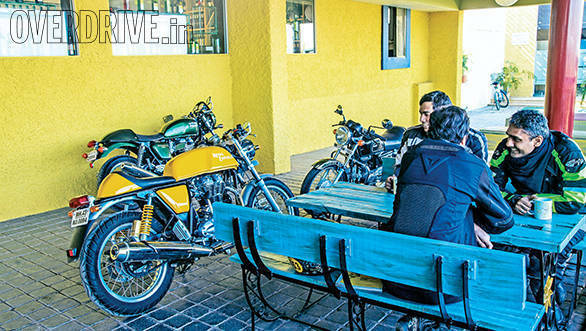 And wouldn't you know it, the bikes we chose to ride were the Triumph Thruxton, Royal Enfield Continental GT and the Hero Splendor Pro Classic. Yes, they're all cafe racers. I told you there were too many around. Alan D'cruz made those Puss in Boots eyes so - I'm such a softie - I let him have the Triumph Thruxton for most of the ride while Rishaad Mody elected unilaterally to pick the Continental GT, so that's what he would ride for the most part. 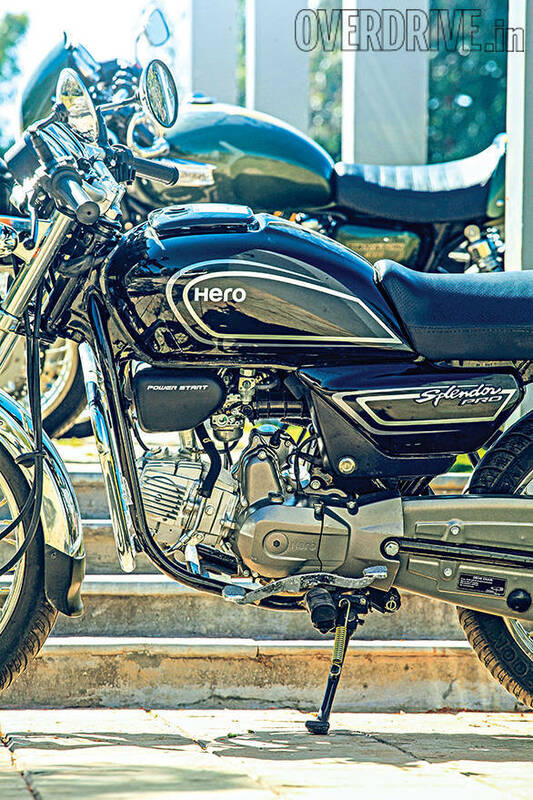 I, then would be on the Hero Splendor Pro Classic, a motorcycle that's received more than a few reviews that question the wisdom of this motorcycle and its intent. Since my wisdom and intent have been questioned quite often as well, we were made for each other, for this ride, at least. Now that we had our, ahem, racers, we began to look for cafes. Our gaggle of interns showed their collective smarts by individually pitching MotoCafes to us. This one's in Mumbai, that one's in Pune, this one has branches in sixteen cities... MotoCafes are also currently in danger of becoming like the Columba Livia Domestica, or the domestic pigeon. There are too many of them, not enough of them actually care about the quality of their coffee and alarmingly few lie at the end of a great riding road. No, the crowded street outside your house that leads to RK Ramaswamy & Sons Motorcycle Cafe and South Indian Restaurant is not a great riding road. At this point, Varun Anchan, who was tasked with the 'maaad' task of photographing this story chimed in. "Shumi Sula," he said, succinctly. Sula? They're wine people no? "Actually, they're fine people who're into wine," said Varun with cheek and a smile. Sula's Vineyards near Nashik boasts mountainous terrain where road engineers have no choice but to bring out their protractors. I didn't want to go into a crowded place. But I was assured by all concerned that the famous Sula Fest - you should go, it's great they tell me - wasn't until later and that we would be more than welcome to have Sula's coffee. "Wine tasting?," ventured one person who shall not be named. You can either ride or taste the vino - we weren't actually stopping for more than coffee. Thankfully, this person made the right choice but was denied a motorcycle anyway. Let that be a lesson, whippersnapper. Besides we were planning to ride nearly 390km with something like 250 of those on twisty roads of unknown vintage. That's a whole day of riding. The other idea we also gave up was the Racer bit in the motorcycle format nomenclature. There's no way my 8PS Splendor Pro Classic would compete with the 865cc Thruxton, though my economy figures would later bring the other two bikes to tears. But that comes later. Since I have a great fear of being out on the highway in the dark, we decided to leave at 0500, about two hours before sunrise. Darkness caused Rishaad to take the wrong turn on his way to the meeting point and then I turned out to be the only one who hadn't filled fuel before meeting up. As a result, the amount of time we actually spent riding in the dark was limited. 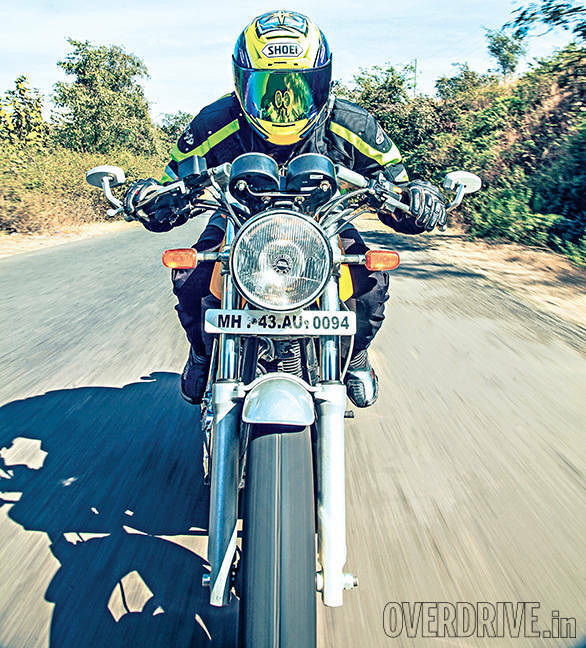 I just had enough time to thank Royal Enfield for the gigantic and powerful headlamp on the GT. It lit the way forward for me all the way into sunrise because the Splendor's light - old school and not connected direct to the battery - was kind of weak. It was also very cold. Us Mumbai-dwellers are cursed with nearly a constant weather state in our city. What that means is that we tend to forget the existence of winter, which is a startlingly common annual phenomenon elsewhere. As soon as the city dwindled to a soft glow in our mirrors, the temperature plunged. Thank god for the near foetal positions that Cafe Racer riders have to adopt. It made us look like performance stars tearing towards sunrise when all we really wanted to do was curl up into a ball and wait the cold out. By the time the sun came out, we'd gotten used to the pronounced nip in the air. From the darkness had emerged some very forbidding looking mountains of the upper end of the Deccan Plateau. And as you know, once the roads start to curve, circulation comes flooding back to motorcyclists' extremities. I felt warm cornering the Splendor Pro Classic. And yes, I can explain that. I would say that the Splendor Pro Classic is the truest cafe racer of these three. The purists will tell you that a production cafe racer is by definition an impossibility. The original cafe racers were born out of humble, everyman's motorcycles that were lightened, sharpened, honed and tuned for performance. Performance that was used to connect cafes at whatever speed these motorcycles allowed. 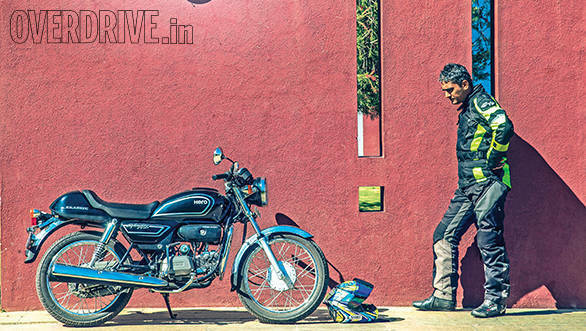 The Splendor is perhaps the ultimate humble everyman's motorcycle today. And believe me, if just two per cent of all the Splendor owners were to do something like say, add a third rear view mirror to their motorcycle, it would have the numeric momentum of a global trend. So thank god they didn't. Because if they did, you would, within six months, be looking at a rash of motorcycles with three mirrors. I felt warm cornering the Splendor Pro Classic because of how cornering it feels. The Splendor has humble origins. A commuter of great sales but of mediocre ability and old design. It wasn't built for cornering, it was built for mileage. And then it had these weird W-bars slapped on and that rather comely cowl and it gained a new name - Classic. But when you take this unlikely proposition, some would say apparition, around a corner, it smiles at you. With glee and with promise. The tyres seem to hold up and the chassis goes where you point it. The narrower bars actually feel good to hold and after a corner or two, you're not just leaning the wee Splendor all the way over, you're looking for the next corner. And it gets better. Because it was born off the rib of the humble commuter, the Pro Classic is all about being hardy and reliable. So in the unpredictable, unknown corners, you can not only hold on to the coat tails of faster motorcycles, you can actually pass them if you're game. They're slowing for bumps while you're hammering through. Of course, we aren't done. The Splendor Pro Classic not only sat near its top speed for all of the 390-odd kilometres we rode, it did the whole thing on one tankful and let's be clear, it still hasn't hit reserve. Take that, you two hopped up glorified British bulldogs! As happy as I was to be riding the Splendor Pro Classic, my secret was obviously out and its wee key was not in my hands for long. 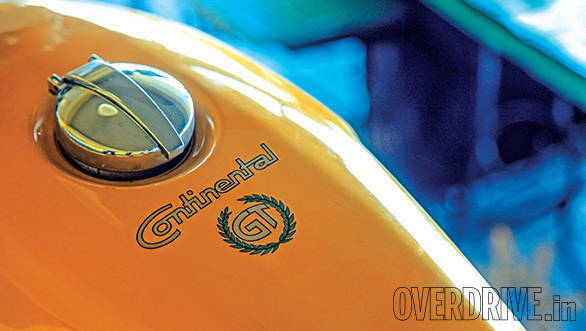 We were obliged to swap motorcycles and I was handed the lusty yellow Continental GT. Which I must note, once again, looks rather good. 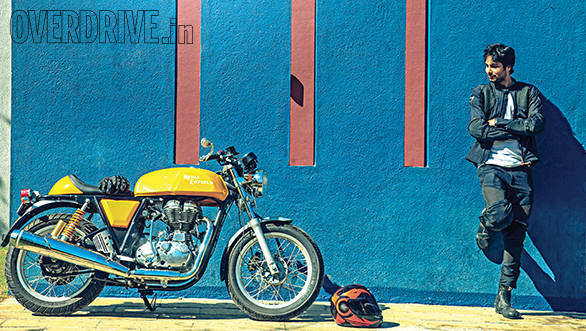 If the Thruxton had been in silver and polished to a high gleam, it might have outshone the GT. But it was this classy understated green and Alan hadn't really wiped it down, therefore, the GT to my eyes looked absolutely the best here. As it turned out, it also went rather well. The roads we rode were narrow with lots of bends but there were very few hairpins or tight corners that tend to trip up long motorcycles. Narrow and unpredictable also holds speeds in check and we must have been hovering between 60 and 80kmph most of the time. Even on the straighter stretches of highway, the GT was in its element. The rules of convoying meant that we went as fast as the Splendor wanted to. 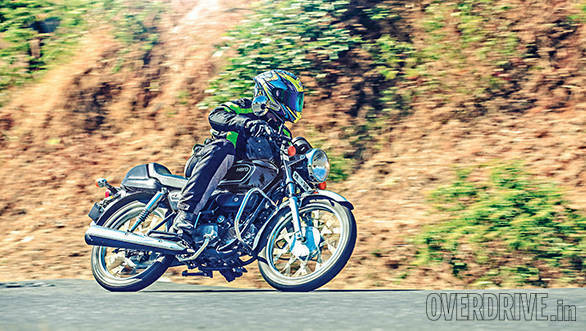 And the Hero wants to do 80 indicated kmph, which is about 10 in-dicated kmph below its flatout vibey-thrashy top speed. At this speed, the GT is sublime. The sound is a muted thumpy-throb down below, vibration which lies as little as 10-15kmph north is held well in check and it all feels absolutely peachy and perfect. The miles roll by quietly and smoothly. Beautiful. But off the main highway, the roads were a lot more trying. Certain stretches were ravaged rather greedily by the monsoon and others were in excellent nick. And it would switch from one to the other without warning. When the roads were good, the GT was an absolute pleasure. 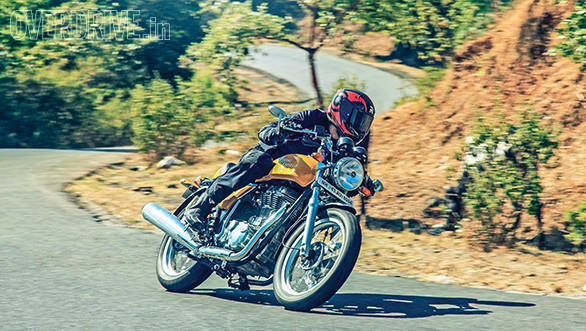 The new Harris-developed chassis is composed and responsive and I've never cornered a Royal Enfield as confidently as the Continental GT. Given just a little bit of time, you can find enough confidence to grind out the pegs and then carry on pushing the chassis a little bit more anyway. But when the bumps arrived, I was in for a surprise. Because the GT actually manages most of them rather well. It only wants you to not roll off the throttle in the middle of the action. The suspension isn't capable enough to manage the really big bumps, especially if leaned partially over but while Rishaad was hammering the ever living crap out of the Splendor Pro Classic with obvious glee and no side effects, the GT was happy to keep up most of the time but had to be backed off for the really bad stuff. I was actually secretly quite thrilled with how the GT felt. Then we decided to stop for another coffee. Well, we tried. We asked for coffee and the surly owner of this little cafe in the middle of absolutely nowhere smirked back at us. This place, currently Andoba Dhaba will be a MotoCafe soon, you'll see. Anyway our options were vadapav, chai and take it or leave it. About twenty minutes later, I was on the Thruxton. Which I happen to rather like and Bert happens to fancy as a future garage dweller in his house. But my first reaction was, "Small!" The Continental GT actually feels slightly larger than the Thruxton. 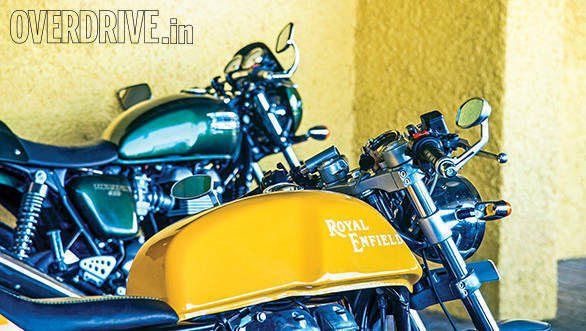 It's a combination of a tank that's less long and hence, bars that you can reach easier but there's an inescapable feeling that you've moved up to a smaller bike when you hop off the Royal Enfield and jump on to the Triumph. But the two are, anyway, chalk and cheese. 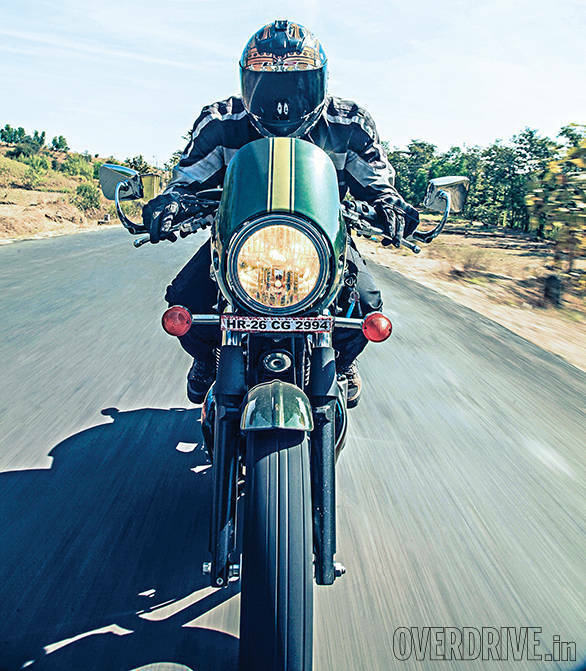 The Thruxton's engine is the lovely parallel twin that gurgles happily at this pace and will calmly propel the Thruxton, wee windshield and all well past the 150kmph mark in a flash. 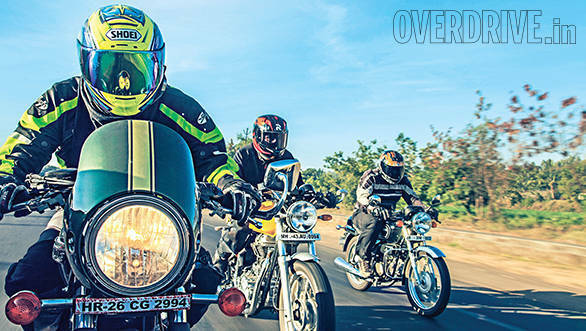 On our ride, the Thruxton felt alert but never stressed and showed immense composure and fortitude in the face of some really terrible stretches of road that no British cafe racer has had the ignominy of facing. Especially not with a 90kg Alan on board, that's for certain. But it's a precise motorcycle which actually feels like the genuine cafe racer because around the corners you do feel that sense of length as well as weight. Like the proper old-school British bike it is. 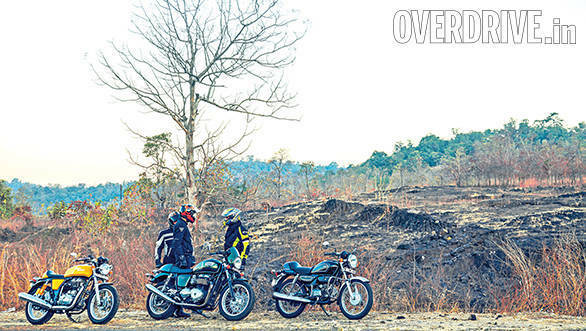 By the time we emerged from the small roads on to the final 60km highway drone back into Mumbai we'd learnt a few things about cafe racers. First, British cafes must have been placed quite close together because the tilted forward riding position isn't something you can hold for more than short bursts without considerable physical conditioning. And the British as a people are not famous for their considerable physical conditioning, so that's out. The Splendor is the easiest to ride because it is compact and you can basically sit up and ride it if you choose to. The Enfield has the longest reach to the bars and that makes it the hardest work in some ways. Thank god these are production machines then, because the modification guys routinely place their angled clip-ons inches above the front axle and I would not want to ride one of those machines 400km at a stretch. In my world, the best chiropractors are the ones you never meet. Second, as an ownable format, the cafe racer is wildly impractical. We all consciously stored all our belongings for the day in Varun's photography car. You know, for the spirit of the thing. And that was a good thing because single seats and plastic humps are not good for luggage ferrying. You're left with tank bags and backpacks which both are self-limiting in size and weight. And before you point out the bags the sizes of small houses that all the courier boys now carry - they're not tilted forward all the time like a cafe racer rider or India's rash of small town airports. Third, you can have immense fun on any two-wheeled device. The glowing string that ties up this ride is that we might have jibed each other's bikes and ribbed on recklessly about how we were all on the best bike of the crew. 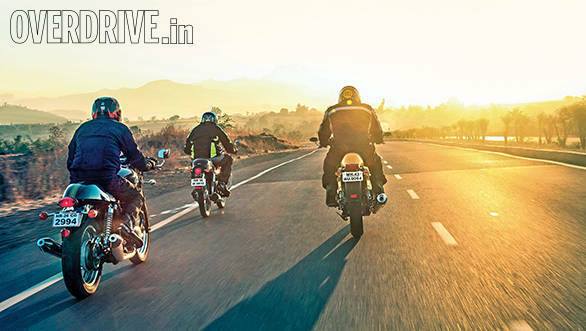 But the fact is between the twisting road, its unpredictability and the lovely composure of all three bikes, we'd had nothing but 400km of smiles and laughs. Some at each other's expense and some on the back of how good a time we were having. As the sun began to dip back to its nightly home, we parted ways. 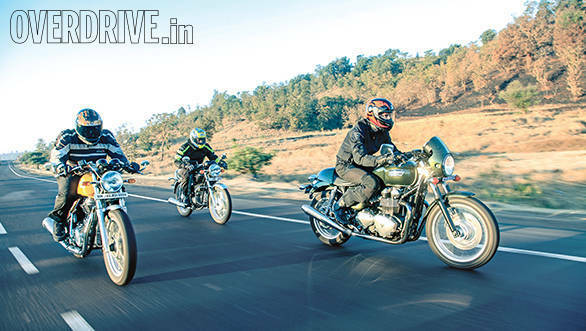 Me on the Splendor once again, Mody on the Conti and Alan on the Thruxton. It had been a good, hard ride just the way we like it here at OVERDRIVE. And the moral of the story had become clear. There are too many cafe racers in the world. And there's nothing wrong with that. Trouble is that cafe racers promise lots and deliver less in today's day and age than many other kinds of motorcycles. Back in the day, they were fashioned by people who wanted more from their bikes. Today they're a visual reminder of our past obsession with performance and current fascination for how we look. That's why the production cafe racer is by definition impossible. But here we are, anyway.